Can you make it a "45°" thing and then sand it? Assume 1" material; then if the inner radius is 3" the outer radius is 4", difference in circumference is ~6 1/4". Around a 90° corner the difference is ~1 1/2", so 1.5 divided by the width of each cut gives you the number of cuts, spread across 1/4 of the inner circumference — 4 1/2". a8 . Great job so far. Have you considered skinning your shell lengthwise. That way if you had access to a tablesaw you cut your kerfs with that. 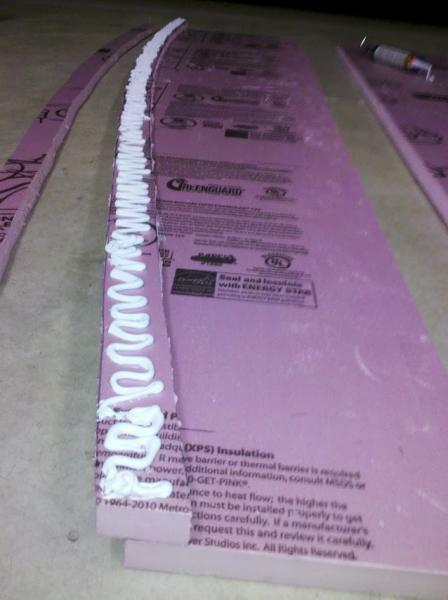 At any rate to get a 3" radius you will need to cut deep enough so that only about 1/4 " of foam remains and for the spacing use freebeards formula. I found that the foam has a slight natural bend to it so you need to use that to your advantage. The idea in theory is have the spacing so that after bending to the 3" radius the kerfs will will be closed on the inside. I found that in reality that if after bending you have kerf openings they can be filled with epoxy/micro mix and the fiberglass cloth can be layed directly into that mix . 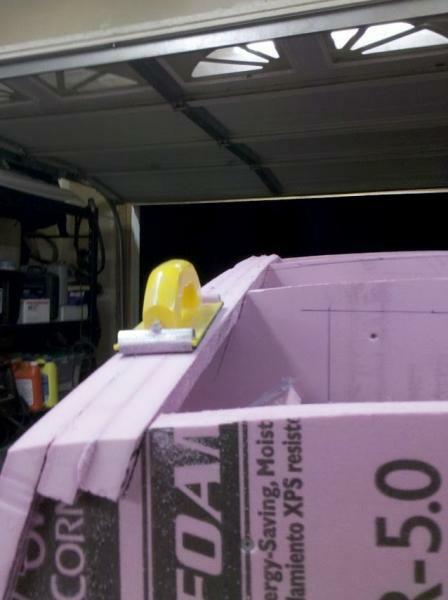 On the nose of my camper which is 2" foam bent to a 2 3/4' radius I used this method and it worked great. Ok, cool... I'll have to approx double the number of cuts I'm making, and go a little deeper to get to the 1/4" depth. I thought about going lengthwise, but decided it would probably be easier to go horizontally and blocksand along the length. We'll see... I don't have a tablesaw, so don't worry about the throatplate splitter. Well, I had a couple more tries at getting the bend in the foam to work, but kept breaking it... might be cause I couldn't really cut clean grooves w/ the dremel. :/ Anyway, the new strategy will be laying the panels lengthwise, letting them overlap at the corners, and just sanding in the curve like Chaz suggests. No new pics today, but I put the rest of the bracing in between each x-section for the shell and should be ready to cut & screw on the top and side panels using the alternate method in the next couple of days. a8 Well I guess a tablesaw is better for the job of cutting the kerfs. 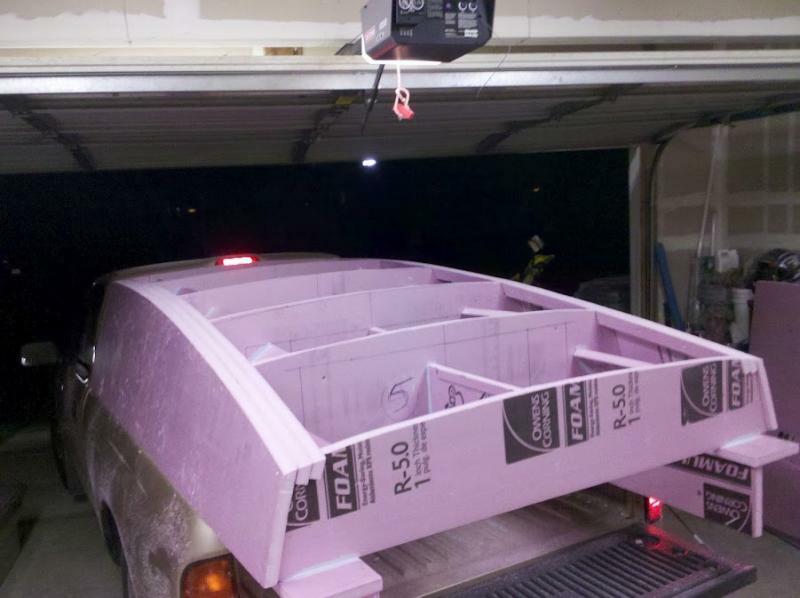 If your going with Chazmt's method (and you may already know this) you can just cut the foam with a saw and then sneak up to your line with homemade sled like this and get a perfect angle. This is one for 90 degrees but with a simple spacer you can make any angle you want. Just in case someone is interested in what can be done if they have a tablesaw and at the risk of going too far on your thread I thought I would post a few more pics. I cut the side panels for the shell last night. Started by tracing the top profile onto a side piece. 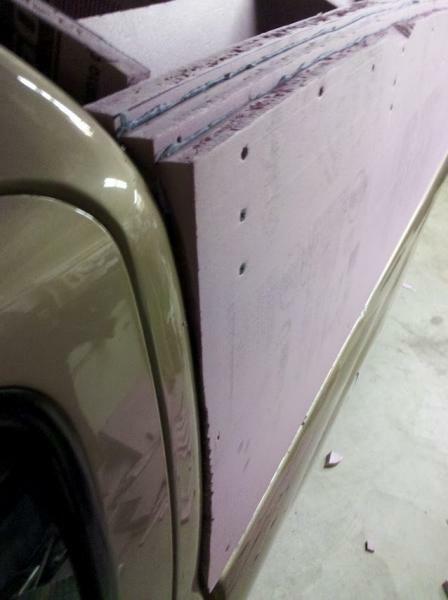 Then offset the line down 1" so that I could lay the top panel over top of the side panels. I'm going to be out of town all weekend, so next update, attaching side panels and top, will be next Monday. Happy Friday! Excellent. So essentially you will have 2" or so of foam but just where you are going to sand your radius right? Also it looks to me from the pics that you screwed the pieces together until the glue set. Is this the case? Last edited by turbothrush; 09-15-2012 at 04:25 PM..
With 2" of material you can only get ~1" radius without weakening the edge. But you could cut blocking out of you scrap and glue it on the inside and get whatever radius is required. This glue works pretty good... When joining the pieces, it's difficult to use enough screws to get a good seal, but if I go along w/ my hands and squeeze the glue out along the entire edge of both pieces, they don't separate afterwards. 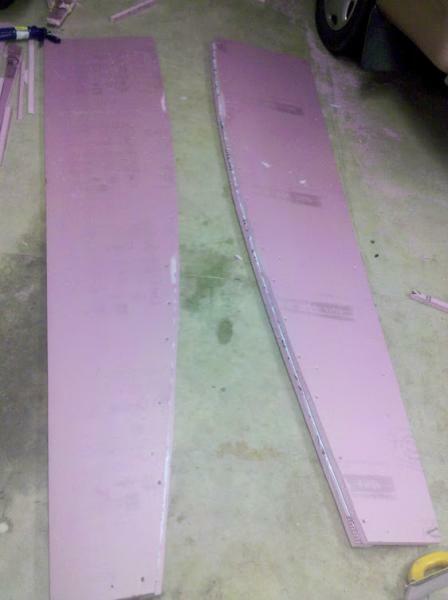 The glue joints also sand well once two pieces of foam board are joined together... When I sand across a glue joint, it tends to ball up before the pieces separate, so the joint stays steady and solid. 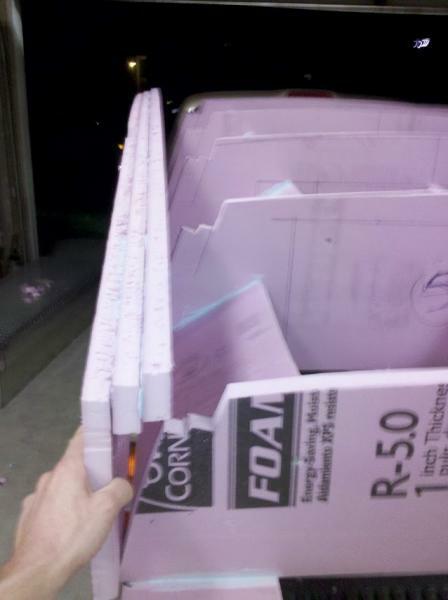 Per freebeard, I may not have made the corner foam thick enough... 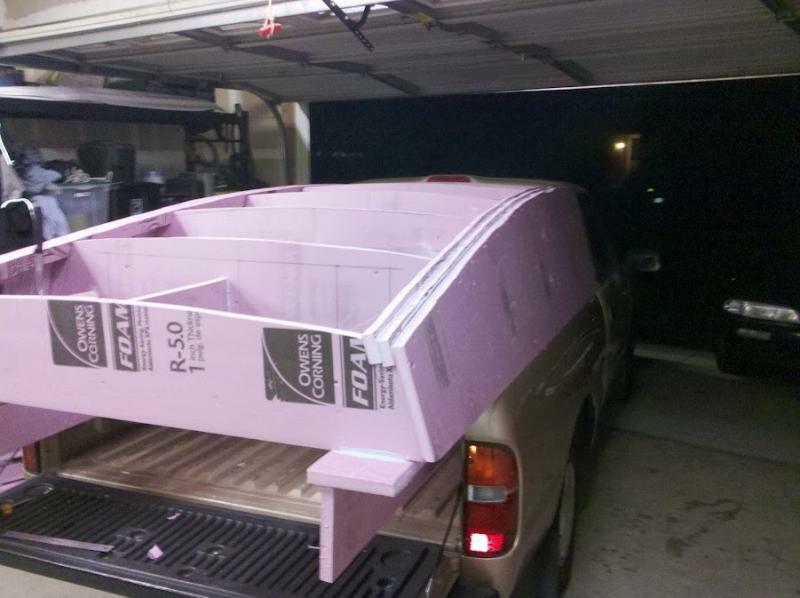 I glued an extra layer of foam on yesterday to add some thicknessm, but I might still need to add some spray foam to the inside before I lay the inside layer of fiberglass. We'll see how rigid it feels after doing the outside layer. Both sides sanded flush w/ the top profile so I can glue top panels on and then radius the top->side corners... tomorrow or later this week! the top surface is spherical... so I'm wondering how many pieces I'll need to get the foam to lay smoothly... 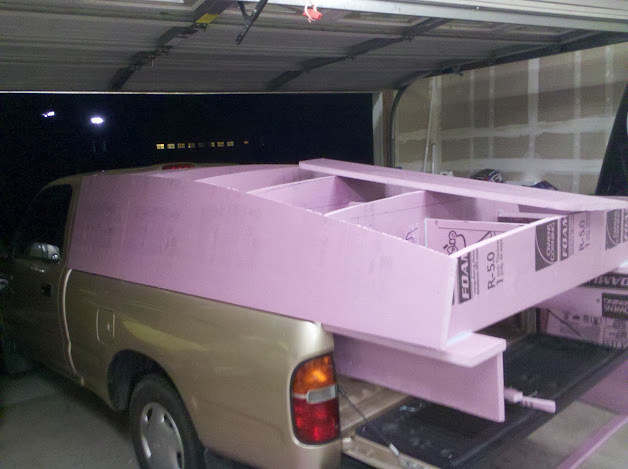 Ideally, I'd use two pieces, joined along the middle from cab to tailgate. 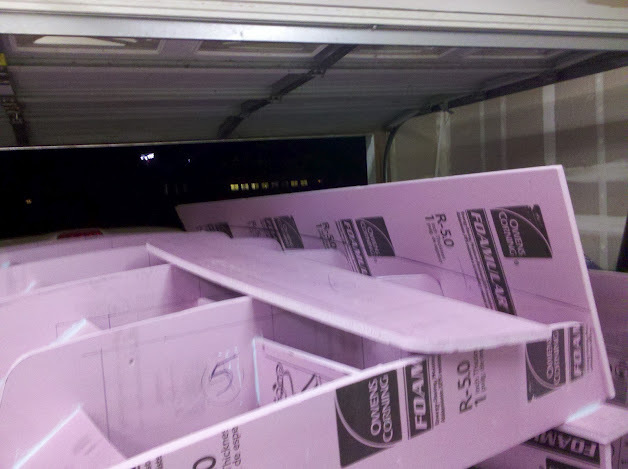 I think the foam has enough flex to do this. Soon we will know!!! Last edited by a8ksh4; 09-19-2012 at 03:57 AM..